Senior 157-pounder Austin Sommer takes control during his match against Joe Bonaldi of Binghamton University Jan. 22 at the DAC. Sommer lost the bout by a 6-4 decision and the Bearcats defeated the Dragons 22-18. The weekend looked promising for the Drexel wrestling team as they got their star redshirt senior, Brandon Palik, back from a rib injury, but the Dragons ultimately fell to both Hofstra University and the United States Military Academy. Drexel’s weekend started with a trip north to visit Hofstra Jan. 24, but the Pride was able to slay the Dragons by a score of 29-9. Head coach Matt Azevedo got wins from two of his standout seniors, Palik at 197 pounds and Austin Sommer at 157 pounds, but those were the only individual victories the mat men could muster. Sommer won on a 5-3 decision, while Palik recorded a pin on his opponent. Looking to bounce back and finish the weekend on a high note, the Dragons returned to the DAC to take on the Black Knights of Army Jan. 26. Drexel started the match off strong, jumping out to a quick 13-3 lead through the first four weight classes. Freshman Tanner Shoap recorded an easy six points when his opponent forfeited, and freshman 133-pounder Kevin Devoy dropped his opponent in a major decision. After freshman David Pearce fell at 141 pounds, freshman Matt Cimato came away with a gritty 4-0 decision to give the Dragons an early 10-point cushion. After the slew of freshmen early in the match, the results started to head south for Drexel. Sommer dropped a hard-fought 8-5 decision at 157 pounds, followed by Jason Fugiel and Kevin Matyas falling in major decisions. Then, at 184 pounds, freshman Alex DeCiantis dropped a close 6-2 decision, leaving the Dragons in a 17-13 hole heading into the final two weight classes. This was when Azevedo and his coaching staff used a little bit of strategy to try to steal a win from Army. Palik is normally a lock at 197 pounds and can really beat anyone, however Azevedo felt that Bryan Sternlieb had a better shot at winning at 197 pounds than Joe Giorgio had at winning his heavyweight match. So, with a little bit of mixing and matching, Azevedo bumped Palik up to heavyweight and wrestled Sternlieb in the void at 197 pounds. The strategy did not work out as planned though. Sternlieb fought hard in a tough test, but fell in a 4-0 decision. The loss at 197 pounds gave Army an insurmountable 20-13 lead heading into the final match. Army needed every bit of the advantage too, as Palik earned a first-period pin, but it was not enough, as the Dragons closed out the match with a 20-19 loss. He continued explaining the strategy. “What we were thinking was if we only gave up regular decisions at 165, 175, 184 and even 197, and Brandon got a pin, we would have won the dual meet. And that could have happened, but we lost by one point,” he said. 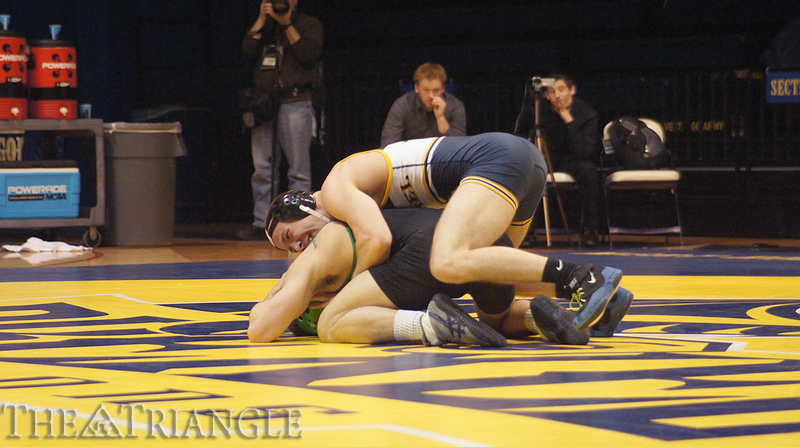 Although Drexel lost both of their weekend matches and fell to 4-13 overall on the season and 0-4 in the Eastern Intercollegiate Wrestling Association, there were some bright spots. They got their senior leader back, and he did all he could be asked to do, winning both of his matches by pin. Azevedo also saw some promising flashes from his freshmen after the Dragons jumped out to a quick lead against Army on the backs of the young guys. Drexel will welcome the Duke University Blue Devils to the DAC Feb. 1 at 7 p.m. The Dragons hope Saturday is the day they can put all of the pieces together at once and come away with a team victory.